Boil the whole lobster for about 20 minutes. In a bowl, squeeze lemon juice and mix with the same quantity of oil, salt and pepper. Cut the lobster in two, lengthwise. Take out the black liquid from the lobster’s head, and add it to lemon and oil. Remember that the lobster’s head also contains the stomach (a transparent little bag) which must be removed, together with entrails string along the lobster back. 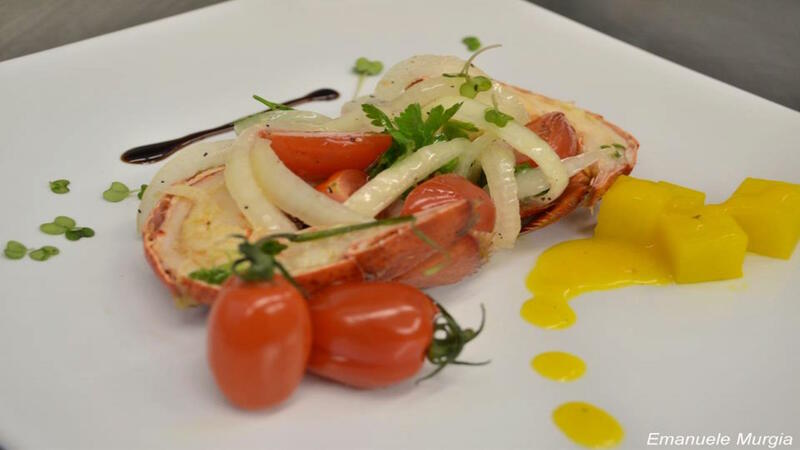 Now, cut the lobster into pieces, add sliced tomatoes and the row onion, dress with lemon and oil sauce. Mix well. Keep refrigerated for 3-4 hours.